technology to get the job done. cleaning and new cutting-edge technology is second to none. 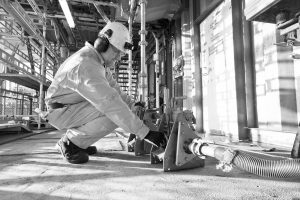 Our range of mechanical and chemical techniques, conventional cleaning and inspection technology is second to none. We combine cutting-edge inspection, with first-class cleaning and planned and programmed maintenance and repair scheduling. We are industry leaders in the field of inspection and testing services, with a focus on Remote Visual Inspection (RVI). We own and operate equipment for underwater, in air, confined space and explosive atmosphere inspection services, giving us the ability to perform Non Destructive Testing (NDT), including but not limited to Optical Gas Imaging, Thermography, Concrete Testing, Metal hardness testing, UT, IRIS, MPI, as well as performing retrieval and cleaning activities. We also have cleaning technology no one else has – we are exclusive license holders for all Aqua Drill International high pressure water jetting services. Our Aqua Milling® process is the most advanced cleaning technology available today, based on years of development, continuous improvement in design and operational experience. We offer specialist industrial pipe, heat exchanger, tube, tank and vessel cleaning services. Other possible solutions include: Aqua Milling®, PIO Aqua Milling®, Aqua Rover®, Tank Spider, Aqua Lancer and HAPP. So, no matter how tricky your problem, if we don’t have the answer, we will find it. If it doesn’t exist, we will make it. Then we’ll deliver that solution, to save you time and money.